It's amazing that 10 years have gone by since we started Polymer Clay TV, June marks our 10th anniversary and it feels like we just got started. We have so much in store for you and we have tons of new things in the works. We want to thank you from the bottom of our hearts for all of your support and friendship over the years, it has truly been an amazing journey! Of course after 10 years we still from time to time have technical difficulty and for some reason my iPad decided to film sideways so I tried to rotate it which made the video a small square you can't see on a phone. I have since re uploaded the sideways version which should be at least regular size so you can create along with me. You may actually enjoy the angle better who knows. 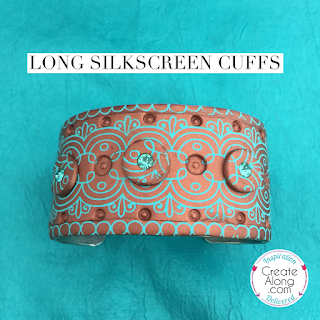 Today I used our long silkscreens to make a cuff bracelet. The beauty of these long silkscreens is you can create one long design that will fit a cuff or necklace and you don't have to piece things together! I don't know about you but that's never fun trying to get rid of seems and such. I ended up finishing the cuff using my metal stamps to add a little more to the bracelet, you can also find those in our shop. I decided I like to leave my clay on the metal cuff rather than pull it off and make it double thickness. To me it is less chunky but you can do what you like best many people bake it on the metal cuff and pull it off and add a double layer of clay to help thicken it, it is up to you but I did leave mine on the metal form.